Schema Projects on of the top Ten! "The dripping reaction of certain oxides with glazes, including a turquoise made from copper carbonate and a blue from cobalt, corresponds to the interpenetration of watercolors touching each other when wet. 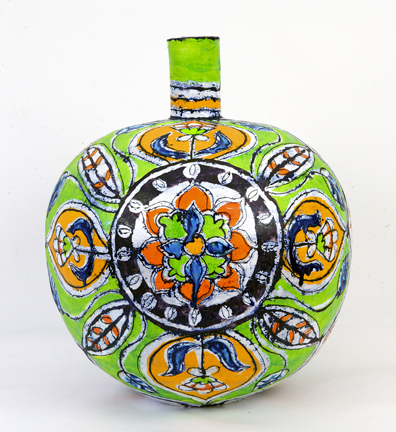 What occurs instantly on paintings takes hours on ceramics, but moments of transformation are frozen in both." 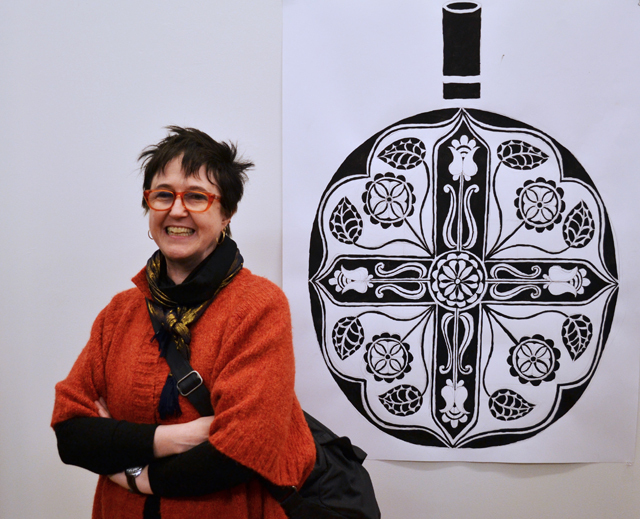 "Elisabeth Kley’s exhibition at Schema is delicate and serene—her sometimes color-filled, sometimes black and white ink drawings on paper house tribal-like designs both meditative and meticulous. Her use of negative white space emphasizes her organic designs and places her bold drawings, vessels and notebooks at center stage for hypnotic revelry." "HER WORK IS EVOCATIVE OF SOMETHING WE’VE SEEN SOMEWHERE IN OUR TRAVELS OR ON MUSEUM VISITS–AT TIMES RECALLING PERSIAN, VENETIAN, FLORENTINE, CHINESE, AND MOROCCAN DESIGN AND ORNAMENT–BUT TRULY ARTICULATES NO ONE STYLE OR ARTIFACT WE CAN NAME OR POINT TO." What is especially striking about the line drawings are the lines themselves, which are roughly a half-inch in width and apparently made with Sumi ink. The densely pigmented blacks are so penetrating that, when you get up close, they seem to obliterate the surface of the paper, giving you the sensation of looking not at a line but into a void. 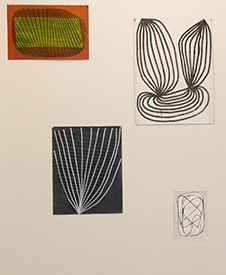 Along these lines one finds the work of Joan Waltemath, whose tightly rendered graphite and colored pencil drawings on mylar denote the gridded structures of Minimalist composition, all the while alluding to a more haptic sensibility in their employment of densely layered gesture, scale, and repetition. The Dinwoodies, a series of these mylar drawings made between 2005 and 2008, is currently on view at Schema Projects in Bushwick. This is the first time the work has been shown, and it is Waltemath’s first New York solo exhibition in over a decade. “Beat Nite is Bushwick at its best. [It] unites Bushwick and the larger art world in moving beyond the gilded graveyards of culture and recognizing a vital alternative spirit for contemporary art. In part Beat Nite serves as an entry point for people new to the neighborhood. There’s the basic question of what I would want them to see. The answer is, first, great art in great DIY spaces. Beyond that, I wanted a selection that would recognize important new venues while honoring the veterans that have given this neighborhood its voice. Finally, I looked for a spread that would encourage visitors beyond the Morgan and Jefferson subway stops out into the larger “Bushwick” community, which includes areas of East Williamsburg and Ridgewood. I’ve called this evening “Beat Nite All Stars” for presenting the guiding lights of a glittering constellation. Schema Projects presents an exhibition of works on paper by Spanish painter Vitor Mejuto. 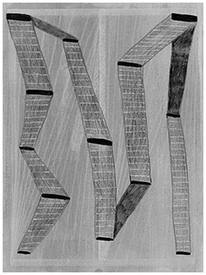 Taking as motif, the "syllabary", a set of written characters for a language, in which each character represents a syllable, Mejuto's reductive forms are carved in graphite line and color. Each comes alive in context of the other, in forthright, no-nonsense ways. The paper space is engaged, forms materialize, flatten, and are treated with vivid color fill, all with a practiced eye for graphic design. In this way, Mejuto harnesses aspects of type forms and sound-images, both aspects of written and spoken language, to paper, line and paint. The aesthetic ancestry of Mejuto's work can be traced as a westward journey through geometric abstraction, from the Russian art movements of Constructivism and Suprematism through the European schools of Bauhaus and De Stijl, landing finally in the Minimalism of mid 20th-century. The strong geometric shapes of that tradition can be seen here, as he curves the bold graphics about each other, creating dynamic and confrontational mono-forms in color. More understated in color and contrast to the tempera paintings, are the graphite and colored pencil drawings which place tangles of interlocking vectors in muted shades against gridded backgrounds, further emphasizing the geometric play. Born in Barcelona and educated at Facultad de Bellas Artes de Salamanca, Mejuto works and lives in Galicia, Spain. In addition to his artistic practice, he works as Chief Photographer for the newspaper La Voz de Galicia. This is his first solo exhibition in the the United States. Rosaire Appel: Untranslated: Sequences, Solos and Books and Carmon Colangelo: Glocal Yocals, Drawings and Sketches and Other Recent Musings, both on view at Schema Projects through May 26, 2013. Above, an installation grid of Appel’s of abstract comics, created through entirely digital means. At first glance, there is no apparent link between Rosaire Appel’s compact grids of colorful digitized abstractions and Carmon Colangelo’s imposing mixed media installation. However, the visual worlds of these two artists not only co-exist but gradually form a stimulating counterpoint when exhibited alongside one another, as they are in the nicely lit storefront space of Schema Projects. A closer look reveals that the medium of digital production methods and the complex narrative sensibility that underlie both artists’ work is what connects these two bodies of work into a cohesive visual and conceptual space. During our interview he said that some drawings take a long time to complete and others resolve suddenly. I was struck when he told me some phrases that pop into his mind when he’s working. For example, the drawing/painting says “I like you now” when it is done. He says the drawing asks, “What do I do next?” and “Where are you?” Clearly, he relates to the working surface as an equal. How Cypher makes lines curbs this subjective temperament, he has firm control over the width of each mark and, with very few exceptions his lines are consistently drawn. He likes to draw with graffiti mops and markers, or pens that have reservoirs of ink so he doesn’t have to move his hand to dip and replenish. 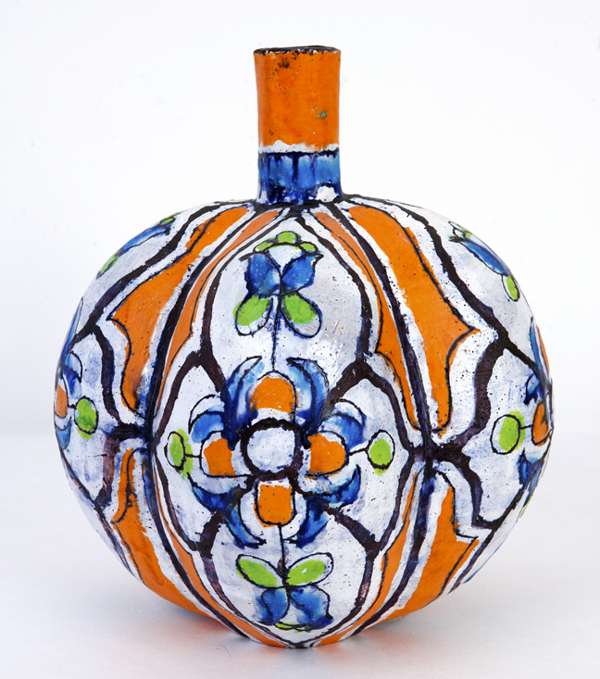 He creates depth with line and color, sometimes allowing himself to stutter inside a firm outline. Efficient, clean, repetitious gestures evoke chalkboards and rulers. Even if Cypher is completely engaged in “the drawing laboratory,” he’s in touch with Formalism–that low voice in the lecture hall next door. In tandem with Cypher’s show, Mary Judge is also exhibiting medium-sized and very small—so small that you may need to borrow the magnifying glass–Indian Devotional Paintings. Judge was inspired in showing these pieces with Brian Cypher’s meditative art as both bodies of work repetitively use dots, line, color, signs and symbols to embody the trust and worshipful attention of their makers. The Hindu god Krishna appears in these delicately and methodically painted paper souvenirs as the black, stone god Shri Nathji. With his arm crooked over his head at a dynamic angle, the mountain-lifting posture, Nathji is said to bring the world into bloom. The stylized format of the Shri Nathjis, springing from a long tradition of anonymous artists working from copies, resonates with the absence of ego and a pervasive, sensual openness I take away from Cypher’s work. Just as behind Indian Folk art stand generations of anonymous artists, so behind Cypher stand generations of scientists, architects, Modernists, and technicians who made exactly the same graphic gestures as Cypher, albeit with different ends in mind. Mary Judge’s new space, Schema Projects, is in the outer reaches of Bushwick. It’s not too far from Manhattan because, as Mary likes to say, “When you stand in the middle of the street (St. Nicholas Ave.) you can see the Empire State Building.” The Greek word schema means shape, plan or model, and Judge will be exhibiting drawings, prints, diagrams, sketchbooks, artist’s books, limited editions, models, and all manner of paper works that aren’t paintings or sculptures. Cypher’s works and the Indian Devotional Paintings will be on display until April 28. Schema Projects in Bushwick is my kind of gallery. Yes, it’s located a convenient three-minute walk away from my apartment, but it offers something that my colleagues in the other boroughs should come out to see. I’ve been to Schema Projects a few times since they opened in late January, and I appreciate that they have really, truly good art, a dedication to young and emerging talent, and an artist-centered approach (the exhibition space is artist-run). They also partner with Blonde Art Books, an organization that specializes in self-published and limited-edition artists’ books, and each exhibition offers a selection of books which accompany and enrich the visual art presented. 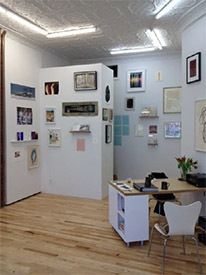 The current exhibition, The scenery changes three times, is curated by Blonde Art Books, and features a mix of works on paper and chapbooks. According to Blonde Art Books, each work in the exhibition has a narrative and a mythology. However, they each also have a “metamorphosis quality:” they shift, they breathe, and their stories are fluid rather than fixed. Artists represented in the show are Brian Belott, Matthew Craven, Sara Cwynar, and Jen Liu. 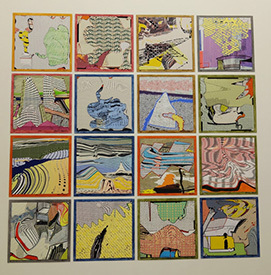 My favorite piece is Brian Belott’s Untitled Laminated Drawing (#1-15), a grouping of several laminated collages displayed Salon-style. 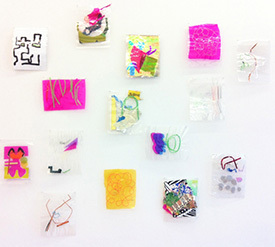 Each laminated pouch contains an arrangement of ephemeral materials, such as bits of paper and string, shiny foils, assorted graphics, and detritus. While they appear to have been arranged haphazardly, the careful placement of cut pieces of plastic film and the delicate swirled loops of string point to the collages’ intentional design. These assemblages surge with electric neon hues, and are made up of fragmented scraps that flash and sparkle. They’re like a record of a party, chock-full of the residues of kinesthetic creation (and even destruction). In keeping with the themes of metamorphosis and narrative, the laminates suggest that something has transpired – an event has occurred – but we have arrived just a moment too late, and all that is left are the echoes of the past. It’s like being confronted with a moment frozen in time, under plastic, but yet the brightly-keyed objects also seem to want to burst forth from their packaging. These “laminated drawings” are playful, celebratory, and tongue-in-cheek, and they hint that they know something we don’t. We want to pick up the sheets, to empty them out and play with them, and to re-create the narrative. Unfortunately, we never can. Schema Projects, 92 St. Nicholas Ave., through February 24th Now up and running after an opening that was densely enough packed to have temporarily altered the physical form of some of its visitors, Schema Projects, located right around the juncture of Bushwick and Ridgewood, is the creation of artist Mary Judge, whose own drawing-based practices are the primary impetus behind the gallery's stated devotion to works on paper. The space's inaugural show, Drafted, features about fifty artists—which does not equate to fifty pieces, in this case—from the US and abroad, and provides insight aplenty into the breadth of variety that 'works on paper' might allow. Visit the gallery now more or less sans crowd and exit without a spinal column like that of Richard III. Brian Cypher isn't afraid to do his thing. Working prolifically with all kinds of drawing and painting materials throughout his career, he seems to be comfortable producing powerful yet whimsical abstractions, no matter the scale he chooses. Schema Projects being a space specializing in works on paper, Cypher's drawings on display here are a selection from work produced over a twenty year span. Amazingly, one finds it a challenge to figure which works were created when. All of the works share a visual relationship governed by Cypher's ability to make seriously considered abstractions appear playful and easy. Relationships between works become more prevalent and visual tropes can be traced between works as the cunningly composed layers of paint open up into vibrant abstract spaces. Cypher is a master of playing with the reveal/obscure abilities of paint, and has a skilled eye in composing the relationship his layers have to one another. Mostly modest in size, the work is able to open up to the viewer the longer one spends time in the gallery. A highlight on view are his smaller works of cut cardboard from food packaging collaged with circular graph paper. 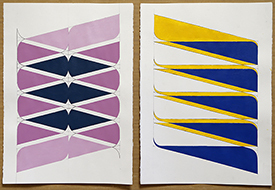 These works all play with the given radius of the graph paper, in a cutting exercise that creates abstractions which are determined by the parameters of the materials. The restriction of their dimensions creates a visual folding of space into itself, which produces various forms, all of which take part in the same formal conversation. The exhibition is a "must see" and will be on view through April 28th. So much paper! What is a clutterer to do? As a lifelong homebody, I hesitate to walk out my front door. But last Friday night (upon a friend’s urging), I ventured outside, and I’m glad I did. Why? 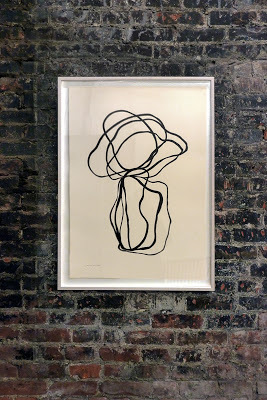 I stumbled across Schema Projects, the first gallery in Bushwick dedicated exclusively to works of art on paper. Conceived by artist Mary Judge, the gallery features drawings, prints, sketchbooks, illustrations, and all things related to paper. Housed in a former barbershop, the project space is modest. The room is spare, enjoys high-ceilings, and it offers lots of natural light. It is a delightful venue to see art. Drafted, Schema Projects’ inaugural show, features more than sixty artists, some of whom call Europe home. Though cosmopolitan, Judge includes local artists from the neighborhood as well. She cultivates a wonderful sense of inclusivity by positioning the works of emerging and under-recognized artists alongside more established names. The work on view spans a range of styles, genres, and mediums. Architectural renderings, digital collages, sculpted paper objects rub shoulders against ink drawings, sketchbooks, and watercolors. As a viewer, I cherished these pairings, which seemed to reward the act of looking. To organize a visually compelling exhibition from this eclectic mix of works on paper is no small feat. Judge deserves special commendation for her curatorial know-how. She does not rely on a one-size-fits-all approach to hanging art. Each work is installed according to its unique qualities. For some works, small ledges are in order; for others, magnets (painted white to match the walls), round-head tacks, or pushpins affixed to metal clips. The attention to detail speaks volumes about Judge’s sensitivity to the medium. As an artist, I am drawn to all things paper. Since childhood, I have carried some form of notebook to jot down doodles, sketches, or drawings. One of the great pleasures of this show is to see how different artists approach this medium. I, too, often rely on a particular convention of mark making. This show offered myriad examples of how artists make marks on paper, or how artists use works on paper as part of their creative process. Of the sixty some odd artists in the show, I had my favorites. 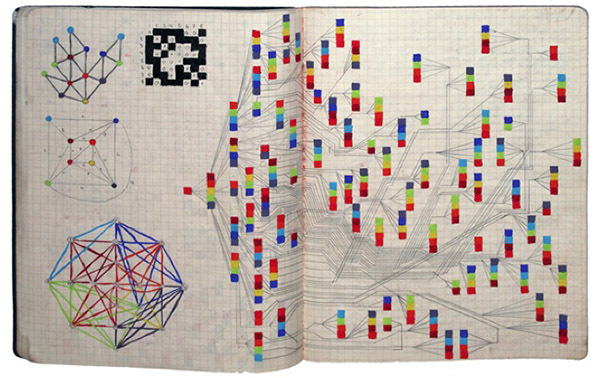 They included Katharina Densinger’s phantasmagoric ink drawing, Joan Kahn’s modest digital print of translucent triangular shapes, Anne Seidman’s quirky abstract collage, Rob de Oude’s minimalist colored pencil drawing, Traute Mathes’s harlequin-inspired fashion illustrations, and Owen Schuh’s sketchbook of colorful mathematical notations à la John Nash. Drafted continues until February 24 at Schema Projects (92 Saint Nicholas Avenue, Bushwick, Brooklyn).